One way I develop a a sense of place is by studying drawings, engraved illustrations, prints, and paintings. I see my early 19th century world, not through the eye of a camera but via an artist’s interpretation or a writer’s picture in words. 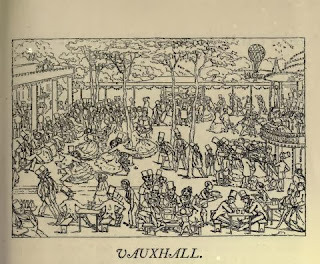 Vauxhall Royal Gardens, which no longer exist, except in some illustrations and a pair of photographs, is a case in point. Looking for images of the place, where important scenes of Vixen in Velvet are set, I came upon this illustration by Richard Doyle. It’s fifteen years later than my story, but all one need do is mentally change the dress and allow for the artist’s humorous interpretation. Equally important for me, though was discovering this work of Richard Doyle’s, and his talent for drawing crowds in a comical way. Apparently, there isn’t as much of Doyle’s work as there ought to be because he was notoriously unreliable about completing his assignments. 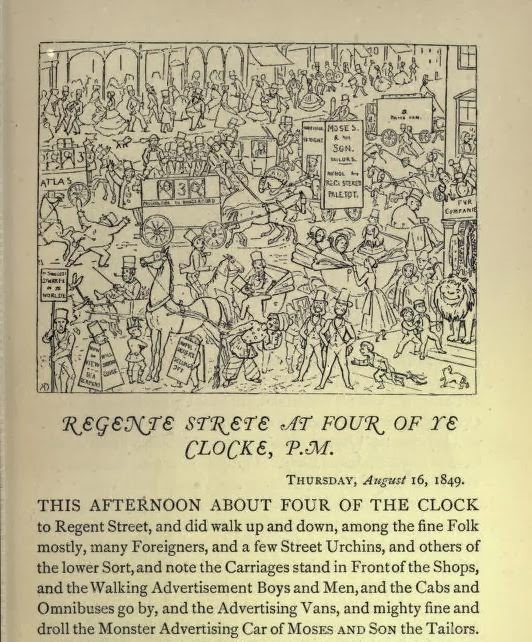 However, he did complete his job for Manners and Customs of ye Englyshe, a delightful little comic picture of London done in the style of Samuel Pepys’s Diary. I was particularly struck with the interpretation of Regent’s Street, which in 1849 bears a strong resemblance to the Regent Street I experienced in the late spring of 2012. My experience didn’t include lions or horses, but the sidewalks were equally jammed, as were the shops. 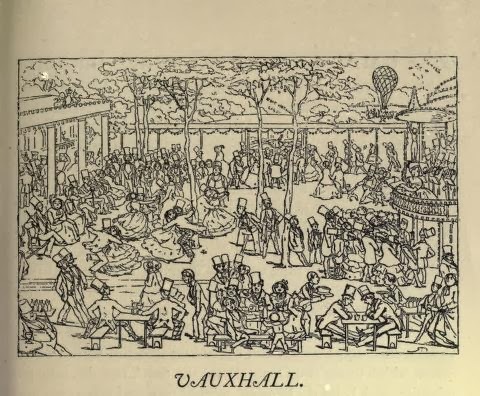 What many people aren't aware of is that we had our own Vauxhall Gardens right here in the old US of A. It was in New York City, on the East Side, not far from Washington Square. Entry fee was 5 shillings, I believe. Yes, that's right - shillings. We still used English shillings until early in the 20th century. Pretty amazing when you think of it. Cynthia, I discovered the NY Vauxhall while researching the London one. Thank you for reminding me, and giving me two future topics for the blog--the NYC gardens & the money! Another enjoyable post. I really like his drawings. They do have so much life. It's interesting that Regent Street didn't change that much during such a stretch of time. But I think a lot of England and Europe is like that. Centuries of tradition. Richard Doyle was also a contributor to 'Punch' magazine. 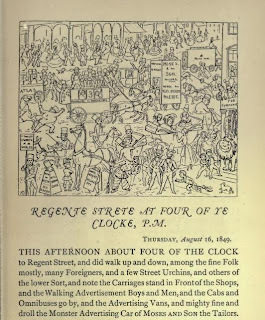 For those interested in London street scenes can I reccomend that you visit the blog 'Spitalfield's Life'by the Gentle author. In the category Street life can be found George Cruickshanks comic drawings for the Comic Almanac for the years 1835,1836,1837 and 1838. There is a different scene for each month. Also the the illustrations by Issac and George Cruickshanks for Pierce Egan's book 'Tom & Jerry, Life in London' this does not feature a cat and mouse but is the exploits of two young men exploring the delights of London, both high and low. It was tremendously popular in it's day with it's use of street slang and it's depictions of low life, it inspired at five stage versions of the book. As regards Vauxhall gardens, Yale University Press produced a book in 2011 'Vauxhall Gardens, A History' by David Coke and Alan Borg. It is a substantial well illustrated tome. More modest is the concise guide by Shire Publications 'The English Pleasure Garden' by Sarah Jane Downing. Shire do ship to the US. They also do a book 'Walking Jane Austin's London'.